Hello ladies and gents, and welcome back inside the lasso. Here we try to shed light on the conversations state lawmakers are having as they consider bills to legalize sports betting. First things first: The guys on the LSR Podcast talked through many of these tidbits last Friday. If you’d prefer to listen rather than read, we won’t be offended. We politely suggest, however, that doing both at the same time could be ideal. Listen to “LSR Podcast Ep.4: Things Looking Up in Illinois and Virginia – In West Virginia, Not So Much” on Spreaker. Regular readers might notice the numbers held pretty steady this time around. There has been no recent movement in new states, and only one new bill appeared last week. It is a potentially pivotal bill, though, addressing an enormous US market. Let’s start our tour in New York, one of those states with legal sports betting pending launch. 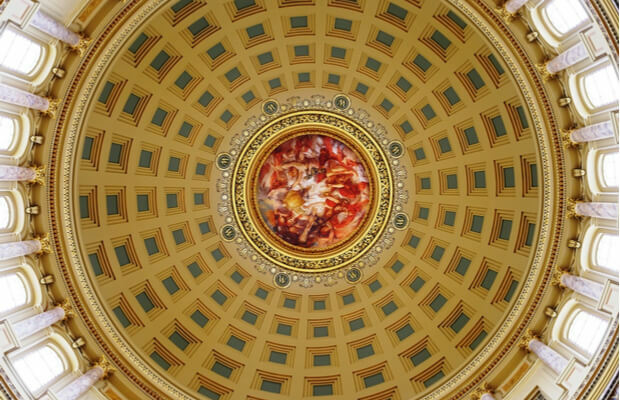 Budget season rekindled the back-and-forth between the legislature and Gov. Andrew Cuomo over NY sports betting. About 10 days ago, LSR learned senators were working to include mobile sports betting in their proposed budget. Sure enough, enabling language appeared last week within the upper chamber’s bill. Lawmakers even secured opinions from a handful of NY law firms to support their position on sports betting. Both sides since weighed in again. Cuomo reiterated his position that mobile sports betting is not a valid consideration right now. The governor has never been a huge fan of NY casinos, and his support for gambling is limited to the existing laws. Sen. Joseph Addabbo, however, doubled down in an interview with LSR‘s Matt Kredell. The budget must be in place by April 1, so that’s the next deadline for this tug of war. Mighty New Hampshire might well be the next US state to legalize sports betting. House lawmakers passed an amended version of H 480 last week, which would allow omni-channel sports betting within state lines. The new bits of language come directly from a Senate bill (S 310) seeking to authorize an even broader expansion of gambling. That one cleared the upper chamber last week, too, so the bills will be able to wave to each other as they cross over. Although they haven’t (yet) passed a matching bill, the two chambers have unified much of the NH sports betting language. Neither bill has yet been assigned to a committee in its opposite chamber. Lawmakers remain in session in Concord until June 30. What are you hearing about sports betting? Last week’s docket included a handful of sports betting hearings, but these two in the Midwest deserve extra attention. Last year, Indiana was a battleground for the leagues’ efforts to collect integrity fees. This year, it looks like data is going to be the hot topic within Indiana sports betting. The inclusion of an official data mandate was a key talking point during a hearing on S 552 last week. The House Public Policy Committee heard supporting testimony from the leagues, as you might expect, but lawmakers remain on the fence. Rep. Sean Eberhart pushed back the hardest, arguing that Nevada sports betting is under no such mandate. Speaking on behalf of casinos, Matt Bell also testified that monopolizing data would only increase concerns over integrity. The Senate already passed this bill, so a matching vote in the House would send it to the governor. After a considerable amount of work, the House Ways and Means Committee advanced an Iowa sports betting bill. The bill (H 648) would allow the state’s 19 casinos to offer sports betting, and proposed taxes and fees are within the typical ranges for other US markets. Prior to committee consideration, some provisions were tweaked to make them more palatable to both sides of the aisle. Amendments include an in-person registration period for mobile betting, as well as a restriction against in-play betting on Iowa student-athletes. Another would allocate additional money to the state’s horse racing industry, but all of these changes could come under scrutiny by the full chamber. Rep. Bobby Kaufmann, who sponsors the bill, tells LSR that he expects the House to pass it early next month. Lawmakers in Hawaii and Montana also conducted hearings on sports betting last week. Hawaii has a bundle of study and task-force resolutions on file, and one of those in the latter group (HR 103) advanced through a committee stop. A more comprehensive effort seems to be afoot in Montana. A House committee advanced an amended version of S 330, which would legalize MT sports betting under the lottery’s oversight. Representatives from William Hill and Golden Entertainment were among those who testified in support. Connecticut: The Joint Committee on Public Safety and Security reported H 7331 out with an amendment. Illinois: A scheduled hearing was pushed back, as the relevant bill (H 3308) is very much in flux. More below. Michigan: The MI online poker bill (H 4311) and its sports betting language advanced through the first committee stop. Rhode Island: A bill (S 37) to authorize mobile RI sports betting was transmitted to the governor for signature. Tennessee: For the third consecutive week, a committee postponed its scheduled hearing on a TN sports betting bill (H 1). Virginia: The governor signed a VA casino bill that could bring sports betting and online gambling to the Commonwealth. So far, next week’s docket is looking a little thin. That Tennessee hearing is back on the calendar in the House State Government Committee once again, but that’s about all that’s on the schedule so far. We are, however, keeping one good eye on Illinois. The bill we’ve been tracking is just a title for now — the Sports Wagering Act — but that is about to change. Last week, Rep. Michael Zalewski filed four proposed amendments covering four possible implementations of IL sports betting. The sponsor’s menu essentially allows lawmakers to choose their own adventure, and the first hearing could come as soon as this Thursday. That’s should be enough to get you going for the week, right? Don’t forget to bookmark our map of sports betting bills for quick reference, and follow @LSPReport on Twitter for updates throughout the week. Here’s hoping your March Madness brackets are still drawing live, friends.